COLUMBIA, Mo. – Mizzou alumna Jeongmin Choi has received the Council of Graduate Schools/ProQuest Distinguished Dissertation Award for her innovative research in plant sciences. The prestigious national award is given to an individual whose doctoral dissertation makes unusually significant contributions to its discipline. When Choi wrote her dissertation, she was a doctoral candidate in plant sciences from the MU College of Agriculture, Food and Natural Resources. For her dissertation, Choi identified the first extracellular ATP receptor in plants. Her successful identification of the receptor has opened a new field of plant research that explores the interconnections among plant stress, pathogen defense and development. ATP (adenosine 5’- triphosphate) is the main energy source inside cells and is considered to drive many life processes in plants, animals and humans. ATP is found in high concentrations inside cells. It also can be found secreted outside cells, which is referred to as extracellular ATP. When the molecule is found outside of a cell, it acts as a signaling molecule. ATP receptors are proteins localized on the cell surface to bind ATP from outside the cells and deliver the information inside the cells. Therefore, the identification of ATP receptors is essential in understanding of the cells signaling pathway. Until now, ATP receptors had been characterized in mammals, but receptors in plants had not been identified. Now that the first plant receptor for extracellular ATP is known, it is likely that this receptor exists in a wide range of plant species. According to Choi, extracellular ATP has a role in many plant functions, but especially in how they perceive environmental stresses such as drought and insect feeding. 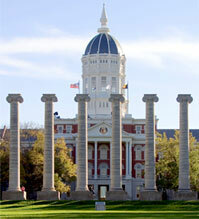 According the Choi’s dissertation advisor, Gary Stacey, Curators Professor of Plant Sciences, Choi was a valued member of her Mizzou laboratory. Choi was recognized in 2014 by the MU Office of Graduate Studies for her outstanding doctoral dissertation research. As the recipient of the MU Graduate Studies Distinguished Doctoral Dissertation Award, she was the first student to be nominated by the University of Missouri for the national Council of Graduate Schools (CGS)/ProQuest award. Choi is currently working as a post-doctoral research associate at the University of Cambridge in the U.K. as a European Molecular Biology Organization (EMBO) fellow. EMBO supports post-doctoral research visits to laboratories throughout Europe.